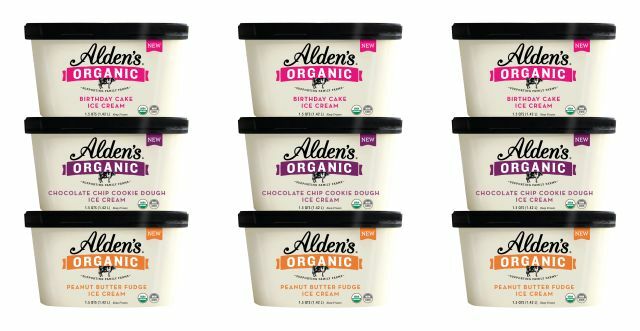 Alden's Organic expands their ice cream line up with three new flavors: Birthday Cake, Chocolate Chip Cookie Dough, and Peanut Butter Fudge. - Birthday Cake - Cake-flavored ice cream with ribbons of purple icing. - Peanut Butter Fudge - Peanut butter ice cream swirled with fudge and peanut butter. 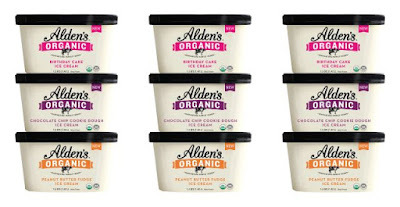 All Alden's Organic ice creams are USDA certified organic and are free of high-fructose corn syrup as well as artificial sweeteners and coloring. The new flavors arrive nationwide starting February 2018. They'll be available in 1.5 quart cartons with a retail price ranging from $6.99 to $7.99.